This was my first, real accomplishment in ritual oils...because I couldn't find anyone selling it! I work with the 7 African Powers devotedly, and wanted something to anoint their candles with, so I created one! This oil is created with patchouli for ellegua, lavender for yamaya, hibiscus for obatala, rosemary for ogun, cinnamon for oshun, clove for oya, and coconut oil for chango. You find won't another oil like this! Hand-blended, charged, and 3 year "set" oil. This is an AWESOME all-purpose altar oil! Adds power to any working or ritual! 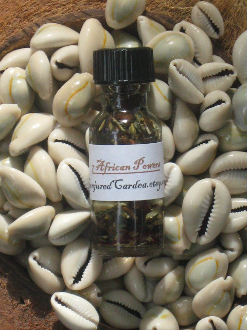 9 African Power oil available too!